The cheese market is now so diverse that to find a niche, maybe even a budding entrepreneur. In the organization Department, should take into account several characteristics of products and to find optimal ways of its sales. Spend a little market research cheese market to identify your niche. 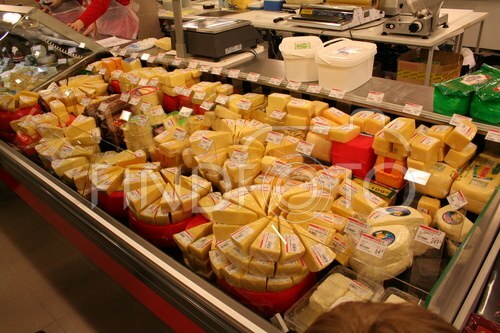 You may find out that the planned site is not enough inexpensive home cheese, or, on the contrary, elite varieties. Purchase glass cooling showcase with good lighting. Sure that she was always perfectly clean. At its discretion can choose the window with the open part, the buyer will receive the opportunity to take any piece that will have a positive impact on the level of sales. Competently compose a range of your cheese Department. 60-70% of all products should be of the most popular varieties are familiar to the buyer. Carefully monitor the price level of these cheeses: if a customer buys one or the other often, he probably knows its value, therefore serious difference with competitors will create a negative impression about you. The rest of the range take for more rare varieties. When they are selected based on the results of your market research. Pay special attention to the layout and packaging of the product. Combine on display whole cheeses with sliced and wrapped in plastic wrap product. If the cheese has a filling or just a nice cut, be sure to rotate it so that the buyer could consider all the components. Combine several ways to split large pieces of 200-300 g, slice on the substrate or shaped plastics, which in this form serve. From various scraps make grated cheese, dividing it between the plastic container and sell at average price. If you sell very expensive cheese, be careful with varieties of small term storage. Buy it in small quantities and shortly before the expiry date make a sale. Selling cheese will be more effective if you add a few related products: greens, grapes, walnuts, wine. All of this can be put on display along with cheeses.